These big multi-royal events always bring questions about those sashes (ribands) our royals wear. They represent chivalric orders, and while they're regal, they can be confusing: why the different colors, and why different ones for different people, and why this one and not that one for this person? So, to wrap up our Dutch inauguration coverage, we'll have a rundown of who wore what - and we'll sneak the gentlemen in here too, as we like to do. First of all, I have two posts on Sashes 101: wearing them in your own country, and wearing them in someone else's country And my general disclaimer applies here: I'm no expert, so forgive any mistakes. Also, this is clearly just a selection of guests and not everybody. Let's start with those that wore Dutch orders. The general rule is that these are the highest orders the Dutch royal family have for their own country, and the highest Dutch orders the foreign royals possess, if they have any at all - though there is at least one exception here. 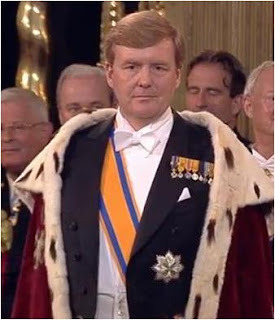 The King wore the Military William Order, which is the highest order in the Netherlands. Unlike in other countries, the highest order does not extend to other members of the royal family, including the queen consort. So, the next rung of Dutch royals has the Order of the Netherlands Lion. The Dutch are pretty generous when it comes to handing out orders to foreign royals (again, if you see the posts I linked above, these exchanges usually happen at state visits). These folks have the Order of Orange-Nassau, which is pretty standard for heirs - Hassan of Jordan is not the current crown prince but he was for a long time before his brother King Hussein died and things changed. Fellow sovereigns and consorts usually get the Order of the Netherlands Lion as seen above, but we didn't see that in this particular guest list. These royals wore the Order of the Crown. Charles actually has the Order of Orange-Nassau as seen above, but wore this sash. And lastly, Princess Laurentien stands alone in the lower Order of the House of Orange. Now to those that wore orders from their own countries. They don't have Dutch orders of their own, which likely means they've never been a part of a Dutch state visit (this explains the difference between spouses in some cases - Camilla, for example, joined the family long after the last Dutch state visit). This is Princess Irene's family, but they have no Dutch orders (they're not part of the Royal House). 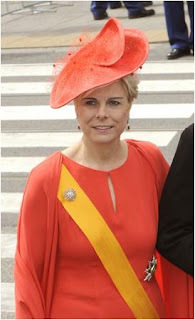 They have their own sashes, though, unlike the families of Princess Margriet and Princess Christina. The Duke and Duchess look to be wearing the Sacred Military Constantinian Order of Saint George; the others here look to be wearing the Order of the Saint Louis for Civil Merit. Foreign royals with no orders are all wearing, of course, the highest order they possess from their home country (left to right): Crown Princess Mary and Crown Prince Frederik of Denmark in the Order of the Elephant, Princess Maha Chakri Sirindhorn and Crown Prince Maha Vajiralongkorn of Thailand in the Order of the Royal House of Chakri, the Duchess of Cornwall in the Royal Victorian Order, Crown Princess Victoria and Prince Daniel of Sweden in the Order of the Seraphim. You see Denmark and Thailand wearing their sashes in the opposite direction of everyone else; direction is specific to the order, and these are two of the relatively few that go over the left shoulder. Foreign royals part deux: the Princess of Asturias in the Order of Charles III, Crown Princess Masako of Japan in the Order of the Precious Crown, Hereditary Princess Sophie and Hereditary Prince Alois of Liechtenstein in the Order of Merit of the Principality of Liechtenstein, Hereditary Grand Duchess Stéphanie of Luxembourg in the Civil and Military Order of Merit of Adolph of Nassau, and Prince Albert II of Monaco in the collar of the Order of St. Charles. Albert was the only sovereign in attendance, and while he has no Dutch order (not much state visit action going on in Monaco, really), he wore the collar of Monaco's top order - collars are a step more formal than ribands. And there you have it! With that, our coverage of the Dutch inauguration festivities comes to a close. Thanks for following along! Readers' Ultimate Tiaras: Your Emerald Winner!